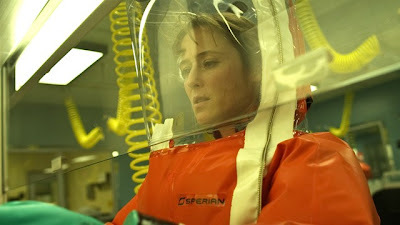 Contagion, the new Steven Soderbergh film, is about an epidemic. Stephen King devoted one of his most famous magnum opuses to a similar subject in The Stand. If you look at medieval woodcuts, you can see the earliest attempts to depict the devastations of the bubonic plague. Novels and films on similar subjects cross a wide variety of genres, from horror films like George Romero’s famed Night of the Living Dead to Nevil Chute’s On the Beach. And depictions of persecution and brain washing run the gamut from the ninth circle of Dante’s Inferno to Nathaniel Hawthorne’s Scarlet Letter and of course The Manchurian Candidate, whose cast of right-wing conspirators (including Angela Lansbury) and leftist brain washers palls next to the reality of the tea baggers, luddite unibombers, ideology driven serial murderers and underground wannabees who populate both the imagination and early 21st century reality. Columbine and Oklahoma City have turned out to be as viral as any plague when you look at the Virginia Tech and Fort Hood massacres. Contagion has been praised for its realism, but can any degree of realism do justice to the AIDS epidemic—a nightmare come to life? Geneologies are created in an attempt to divine the source of the infection, epidemiologists search for ARV's (anti retroviral drugs) and retro-thinkers see the virus as a sign of coming Armageddon. May 21 was supposed to be Judgment Day. Meanwhile, Tom Perotta deals with the imaginative consequences of “The Rapture” in his recently published novel The Leftovers.